About 90 percent of violent terrorists use means such as VPNs (Virtual Private Networks) to circumvent the Great Firewall and the increasing amount of terrorist attacks is part of the international trend, the top leader of the Xinjiang Uyghur Autonomous Region said on Thursday. The wide use of information technology is one of the characteristics of recent terrorist activities and the authorities need to raise awareness, and use professional and advanced ways to stop it from spreading across the country, Zhang Chunxian, Party Secretary of Xinjiang said at the Xinjiang delegation's meeting during the National People's Congress. Zhang said that terrorist attacks are not an indication of a faulty government's ethnic and religious policies, nor does it prove that the government's recent crackdown was inappropriate. "Such terrorist attacks grew after 9-11, Chechen terrorism, and the July 5 riot in Xinjiang. It's a result of the international spreading of conservative or extremist forces," he said. In recent years, the East Turkistan Islamic Movement (ETIM) posted audio and video about terrorism online to instigate the so-called "jihad" against the Chinese government, Hua Chunyin, spokesperson of the foreign ministry, told a media briefing in December 2013. Hua added that online posting has become one of the major and direct causes for the growing number of terrorist attacks in China. China on Thursday also revealed its four-level anti-terrorism strength for the first time, the PLA Daily reported, quoting Xue Guoqiang, a deputy commander of armed policy as saying. A total of 105 terror attacks and severe crimes were cracked down upon in 2013, the media reported. "Violent terrorism isn't a result of our crackdown, but an inevitable phenomenon of society," said Zhang. "It is because we have been taking measures that we were able to contain it so far." On the night of March 1, eight knife-wielding men and women charged into the ticketing hall of Kunming railway station and killed at least 29 people, injuring 143 others. Recent years have seen increasing numbers of violent conflicts and terrorist activities both in Xinjiang and elsewhere. Last October, three people drove a jeep into crowds at Tiananmen Square, resulting in five deaths and 38 people injured. It was later determined to be an act of terrorism. Nur Bekri, deputy Party secretary of Xinjiang, also said that Xinjiang has suffered from terrorism dating back to the 1700s, and terrorist activities today are connected to overseas forces. Bekri emphasized that people need to remember that "terrorist activities don't represent any particular ethnicity or religion." 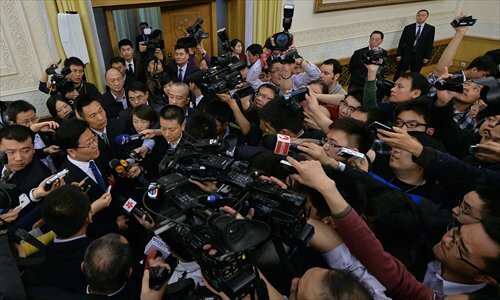 Zhang said the crackdown targets terrorists instead of ordinary citizens. Terrorists need to be hunted down and punished, while for ordinary citizens, they should be able to benefit from reform and economic development, he added.